Eight inland Ocean Coalition members just returned from an energetic, two-day Healthy Ocean (HOC) advocacy training in Chicago. The HOC is a non-profit membership organization dedicated to building awareness of how the National Ocean Policy (NOP) supports our nation’s ability to manage these shared resources. Our goal was to gain a deeper understanding of how our inland work relates to the NOP, and to acquire practical tools to become more effective at describing our work to government decision makers, and others. Early in the training, two Utah Inland Ocean Coalition members, each within weeks of graduating from college, set the pace for participation by volunteering first for a rigorous exercise in how to effectively brief a US Senator. The Illinois Ocean Coalition provided a thoughtful analysis of how citizen science data regarding plastic pollution in small lakes is being used by state and local decision-makers. 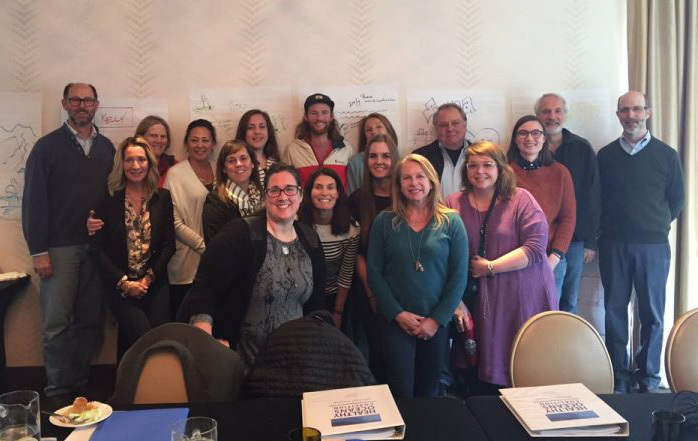 The Colorado Ocean Coalition used the training to think thru best social media practices as it continues to expand awareness of “summit-to-sea” issues from a single to a multi-state organization. All participants at the training gained respect for how the organizers of National Ocean Policy involved numerous parties – from the military, to the Coast Guard, commercial fisherman, investors in offshore wind and oil, town officials, democrats, republications, unaffiliated voters, not-for-profit organizations, citizens, and others, from multiple regions of the country. It was particularly intriguing to learn how these groups identified raw data important to their enterprises and to understand how the NOP organized the data into user-friendly maps. The data is intended to support natural resource allocation decisions to improve the outcome for all parties. For a quick glimpse into one of the region’s user-friendly data portals click here. The participation of the Inland Ocean Coalition was made possible by the support and superb staffing of the Healthy Ocean Coalition and the American Littoral Society.